Learn how to generate inbound sales with inbound marketing and sales funnels. Telling people to “build an inbound sales and marketing funnel” is HORRIBLE advice. Inbound is how you get traffic. Inbound is how you convert visitors into leads. Inbound is how you nurture leads to buy. So, why is it horrible advice? Because, unless you put in the effort to build a full funnel you won’t get the results you need to justify the investment in a profitable timeline. Download How to Build a Full Inbound Conversion Funnel PDF and read on your own time. Your goal of building a Lead-Generating Inbound Program is to generate high-quality leads consisting of sales opportunities that have a higher likelihood of closing. In many cases, there is a gap between minimum inbound effort and what it takes to be successful with inbound. We’ve created this article to help you understand the Full Inbound Sales and Marketing Funnel. Let’s start with the massive benefits you’re likely missing out on and how to create your own highly effective funnel. What does a full inbound funnel look like? The word “funnel” is one of the most misunderstood words in the marketing world. People talk about their “marketing funnels,” “conversion funnels,” “marketing pipelines,” and “sales funnels,” all thinking they’re talking about the same thing. Your process may be what you refer to as your funnel, but let’s make one thing clear: Unless you have a full inbound sales and marketing funnel like the one pictured in the diagram below, we’re not talking about the same thing. As you can see from the diagram above, a full inbound sales funnel is really a nonlinear, multichannel path toward a conversion. You’ll see that there is a generic funnel that should provide value to just about anyone visiting your site (left side of the diagram above). There are also typically 2-3 (sometimes several more) funnels built for specific buyer personas and their buying journey. If you cater to specific industries, you can make the conversion path far more effective by building a funnel focused specifically around that industry (the middle and right of the diagram). Just because they each represent a complete conversion path doesn’t make them a full funnel. A full funnel gives prospects multiple paths to follow, all leading to the eventual conversion. Some buyers will enter into the generic funnel via a blog post, become a lead after converting on an industry-specific offer, and finally purchase after returning to the bottom of the generic funnel. The opposite is just as likely. An effective inbound sales funnel contains lots of content to nurture various types of leads through the buyer’s journey. You can’t expect all of your website visitors to convert on a single offer, just like you can’t expect a blog post or two to drive all of the traffic you need. Most of the full inbound sales funnels we see are extremely lacking in the variety necessary to nurture the different types of buyers reaching their site. And we haven’t even gotten to the persona-specific funnels. Each of your individual funnels that make up your full funnel should follow the same standards. You’ll need around 7 pieces of content for each stage, for each buyer’s journey. You can begin to see where this becomes a little resource intensive, but don’t go anywhere just yet. Start with a single generic funnel around the general buyer’s journey. Generate 3 pieces of content for each stage. Deploy the calls to action, landing pages, and lead-nurturing emails. You’re far from done, but from this point, you can build your 7 pieces for each stage. Once you have your generic funnel created, you can follow the same process for each of your persona-specific funnels. When you break it down like this, the resources invested can be spread out over time which also gives you an opportunity to test their impact, optimize, and improve along the way. Also, you may find that some of your content may overlap between two funnels, speaking to multiple personas and serving to nurture leads in two or more persona-specific funnels. If this is the case, it means you won’t have to create as much content to build each complete persona-specific funnel. Be wary of including too many “general” pieces of content though. The power of persona-specific funnels is in their ability to resonate on a deeper level than your general funnel. For that, you’ll need highly specific content that communicates in a way that shows your buyers how well you understand their pain points. The benefits of a full funnel pale in comparison to this one. The real benefit of an inbound funnel is that, once you’ve created it, the process becomes automated. It will require far fewer resources from your team and consistently generate predictable results, day in and day out. That, that right there, is why this concept is SO important. You’ll need an effective tool (or several) to manage your funnel. There is full-service marketing automation software like HubSpot, Marketo, and Infusionsoft that can handle every part of the process, from website development to content production and publishing. They provide you with the tools to create downloadable offers and landing pages that help capture your leads’ contact information. Finally, the software provides you with an easy way to build out the email automation campaigns (workflows) that will allow you to nurture leads toward the bottom of your funnel and the eventual conversion. These tools are highly sophisticated but extremely user-friendly, giving you an edge when it comes to building out your own funnel from top to bottom. We’re about to break this whole concept into several bite-sized, easily digestible chunks. Before we get too much further, let’s look at why the inbound sales and marketing funnel is so important. Nearly every business website you visit shouts things like “14 Day Trial,” “Free Consultation,” or “Buy This Now” upon the first arrival. Yet most websites focus their messaging exclusively to the “qualified” conversion-ready leads. Why are so many businesses focused exclusively on that minuscule percentage of their traffic? Mainly, because they don’t understand why they need a full inbound conversion funnel. It’s safe to say the vast majority of businesses would see a considerable conversion rate increase from an inbound marketing funnel, but very few actually use the full strategy as a part of their marketing and sales programs. So what does it look like and how do you get started? Let’s take a much deeper look at how you can create your own sophisticated, predictable, and scalable lead-generating conversion machine—a full inbound sales and marketing funnel. You’ll see the terms “marketing funnel” and “sales funnel” used interchangeably in this article. We can do this because, with inbound, the sales and marketing teams stand behind a holistic acquisition process. With today’s buyer, there is no one team responsible for driving the conversions. It’s up to sales and marketing to work together to create the most effective and efficient funnel possible. Buyer just becoming aware of a problem or question that they need to solve or answer. Need to be educated on their problem/question. Buyer understands their need, have moved on to determining the best solution. Need more information on options. The low hanging fruit that is ready to be “plucked” by your sales team. Knows their answer, options, ready to make a decision. Though the buyer’s journey continues post-purchase, for the purpose of this post we’re focusing on the inbound process to generate the first purchase. To establish an effective inbound sales funnel, you’ll need to create a variety of unique content to support buyers in each of the stages listed above. When you provide them with the education and resources they need, you can nurture buyers down the funnel, dramatically increasing the number of qualified leads (BOFU) that are being delivered to sales. The graphic below demonstrates how buyers are nurtured through the stages of the B2B and B2C inbound sales funnel, effectively putting your lead generation system on autopilot. It refers to the TOFU, MOFU, and BOFU stages as they are more commonly referred to when referencing The Buyer’s Journey. The TOFU stage of your inbound funnel is all about driving traffic to your website by helping buyers answer questions and solve problems. It’s likely that thousands of potential customers exist. How do you provide that help? Today most people begin their buying process online. As such, one of the best ways to reach potential customers is by creating highly educational blog posts. Start by determining the types of questions that your customers are asking. One of the most effective ways to find these questions is by consulting with sales. They spend the most time addressing the concerns of your leads. At Uhuru, we create new blog posts every week, answering the questions and solving the problems of the various types of clients we serve. As you can see, we put a lot of time and resources behind blog post creation for our own inbound funnel. Here are 3 important benefits to creating these types of articles. First and foremost, SEO-optimized blog posts drive traffic to your website when search engines place them high in their rankings. Keep creating blog posts that provide value to your prospective buyers and search engines (Google) will reward you by putting it in front of the right people. There is a lot to know about effective SEO. Lucky for you, we’ll be covering most of that information in a later section, so stay tuned. With the right content in place, content can nurture leads toward a conversion all on its own. See, your TOFU content may help your prospects understand that they have a problem. While they’re doing research on ways to solve that problem, they may read your MOFU content about their options for a solution. Finally, once they understand their options, reading your BOFU content could be what drives them to finally convert. Expertly crafted content can do much of the preliminary work for your sales team, saving plenty of time and money. There is more to come on using content to nurture leads in the MOFU section below. Finally, the content you produce as a part of your marketing can be repurposed to help showcase your industry expertise and close more sales. When your team comes across a topic that needs further explanation or a pushback from prospects in their sales calls, they can turn to your content. For example, if a prospect is worried whether or not your company would be right for their industry and you’ve literally written a guide on how to do it, you can consider that pushback handled. Just send them the guide and let them see for themselves just how well you can help them. Content also support social selling. If you’re not already familiar with social selling, be sure to read this guide to discover how it can support your team’s sales process. TOFU content, like blog posts, is great at driving traffic to your website and exposing new people to your brand. It isn’t, however, very good for qualifying leads or closing sales. Instead, MOFU content helps to move people into the skinnier middle portion of the funnel illustrated above. Middle-of-the-funnel buyers are closer to making a purchase because they understand that they have a need. They’re now in the process of determining what solutions are available and which one(s) represent the best fit for their need. While TOFU contacts are rarely worthy of the sales team’s time and attention, there are certain industries and businesses who find benefit in reaching out to MOFU leads. Content is still necessary, and likely the best way to continue nurturing leads to the point of being ready for sales. MOFU content is geared toward people who are genuinely interested. It’s also an opportunity to help them solve a greater problem and meet or exceed their perceived need. One of the most substantial differences between TOFU and MOFU content is that MOFU content is often gated. Adding an optimized and compelling landing page with a lead capture form is often the perfect way to deliver a high-value information product (such as an ebook) while earning a lead’s contact info. Uhuru regularly creates comprehensive marketing guides that provide exceptional value in exchange for the lead’s contact information. With that contact info, you can stay in touch with this lead via email, providing more value and nurturing them toward a conversion at the same time. It’s during this email communication that your BOFU content becomes especially important. Leads entering the bottom of the funnel are ready to buy. The only decision that has to be made at this point is who they’ll buy from. They know their problem, understand their options for solutions, and it’s time to pull the trigger. Typically this requires a low-friction conversion process, strong positioning, and benefit statements from the company that shows the lead what doing business with their brand is all about. Pro Tip: Use irresistible offers that are time bound—free trials to coupons, discounts and free consultations—to reward leads for taking immediate action. One of Uhuru’s BOFU offers is for a free Strategy Session where we analyze your marketing needs and discuss potential solutions to optimize your business growth. Bottom-of-the-funnel leads are ready for you to help them understand exactly why they should choose your business over your competition. That’s why “choose us” content—like case studies—are highly effective tools for leads in this stage of the funnel. You’re able to showcase what you’ve done for similar people/companies and set expectations about what they’ll gain by working with your brand. For example, one of Uhuru’s BOFU blog posts shows you how we repeatedly deliver marketing success while also helping you improve your own marketing process. Uhuru has created several case studies on clients in different industries to showcase the results we’ve achieved and what leads should expect from an Uhuru partnership. These are the things you see most business website displaying to everyone that visits. The problem is this—they’re showing BOFU offers to people in the TOFU and MOFU stages without enough content in each stage to successfully prepare them to be interested in these offers. A wide variety of research shows that people have to be about 60-70% through the sales cycle in order to be willing to talk to sales. Your website and content offers are your digital sales people, so without the full inbound funnel in place, there’s a good chance most of your website visitors won’t be converting. However, with your inbound sales funnel in place, far more TOFU and MOFU leads will find their way to the bottom of the funnel. Whether they convert onsite or with a push from an email or a retargeting ad for a BOFU offer, these leads are telling you they’re ready to be sold. This is why the majority of sales teams find it most effective to reach out to leads in the BOFU stage. With an effective inbound sales funnel in place, sales teams can use your content to qualify and nurture leads based on the appropriate stage of the journey. The lead was educated along the way, now it’s the salesperson’s job to follow up to address any shortcomings, pushbacks, or other concerns that would otherwise keep them from converting to a paying customer. For instance, if your advertising on Facebook or Adwords is generating lots of traffic that convert to leads but those leads rarely become paying customers, it’s time to optimize your marketing. Now that we’ve covered the basics for TOFU, MOFU, and BOFU, let’s look at how to use each of them to create an effective full inbound sales and marketing funnel. The process of creating blog posts that answer questions may seem quite simple, but there are several factors that go into successful SEO that most companies do poorly or miss altogether. Without optimizing your posts, they won’t drive much (or any) traffic. Without traffic, you won’t generate leads for your inbound sales funnel. Without any leads, your sales team will have to revert to cold calling and other less than effective outbound sales tactics. That’s why we’re going to run you through a crash course on creating SEO-optimized content for your full inbound funnel. Why are you creating blog posts and for whom? Developing a thorough understanding of who your content is being created for is vital to its success. Create buyer personas from which you can begin to outline the problems facing your customers, the questions they’ll be asking online, and the answers you’ll be crafting your content around. Keywords are what search engines use to understand what your content is about. In order to decide what keywords to include in your posts, use tools like AHrefs or SemRush. Not all keywords are worth your content creation investment. You’re looking for keywords that have a high search volume (the number of times they are searched for each month). What’s worth writing will be dependant on what it is you sell. For example, if you sell a less expensive product and need high volume to realize meet your goals, writing for keywords that only see a few hundred monthly searches may not be worth your while. However, if you sell a high-value product and need far fewer leads and sales to realize the same goals, it may be a good idea to go after those highly specific niche keywords. The final consideration you’ll have to make when researching keywords are the competition. 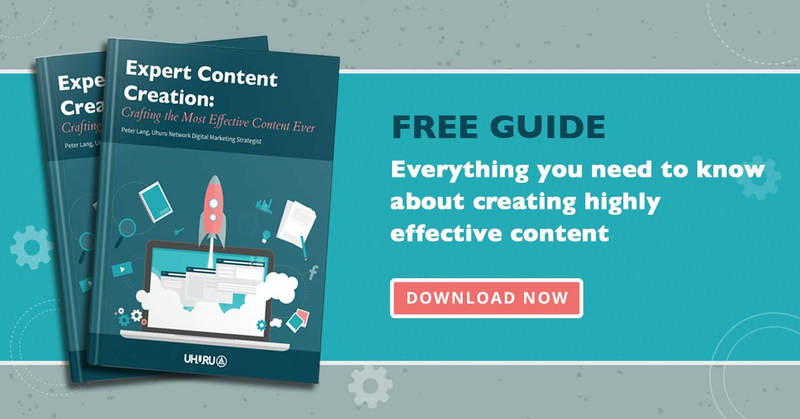 If major players in your industry have already written long, comprehensive content on the topic, you’ll have your work cut out for you trying to outrank them. Look for opportunities that provide you with a high enough search volume and a low level of competition. Short articles that don’t tell the whole story can often be outranked by those that provide users with far more value. Tools, like the ones mentioned, provide a competition score for each keyword to help you determine how difficult it will be to rank your post on the first page. There are certain things that Google looks for to determine relevancy to user search queries. Structuring your articles around the following guidelines can help you help Google understand your article and increase your chances of having it rank higher. Place your keyword in the first and last hundred words of your post. Insert it every 100-200 words throughout the rest of your post (around 2-3% of total copy). Use related keywords (found with the help of your keyword analysis tool) through the post to help define the context of your article. Increase click-through with benefit-driven, emotionally compelling titles. Use subheadings that easily convey the benefits contained in each section. Personalize your content for your reader by including the words you, I, we, us, they, etc. Break up large text blocks with plenty of white space and images. Once you have your post written, it’s time to publish. Help Google further understand what it’s about by optimizing the metadata for each post. Metadata is the information you enter into your publishing platform that gives Google the title, description and other information to display. Your title should be less than 60 characters and include the keyword (near the beginning if possible). Your description should be around 160 characters or less and contain your keyword. Your custom URL or slug should be nothing more than the focus keyword. Any images contained within your post should be named to reflect their content and the keyword. As far as SEO basics are concerned, the information contained in the section above will place you ahead of what the vast majority of companies are doing to optimize their content. However, the intricacies of SEO are vast and ever-evolving, so it’s important to continue learning. For a great place to start creating your blog strategy look no further than this guide on Blog Strategy. SEO tools like the one from Yoast can help you to make sure everything you publish is up to par. Many companies create content to drive traffic to their website. However, with traffic as the end goal, many them find themselves scratching their heads about the high number of visitors and low conversion rates. At Uhuru, we create solid inbound sales funnel first, and then worry about optimizing it for SEO. Creating content that drives traffic is only the beginning. You need to be creating content that nurtures that traffic toward a conversion effectively and automatically. Keyword research may lead you to produce certain articles and pages, but while working with a strong marketing commitment, hopefully, you’d have published those pages anyway. Another aspect to consider is the amount of time it takes to rank organically in search engines. It can take from a few weeks to several months to start seeing traffic generated by your blog content. You could be focusing on paid advertising on Facebook or Adwords to drive traffic in the interim, but doing so without an inbound sales funnel in place would be ill advised. You’ll encounter the same problem of plenty of traffic and fewer conversions. In companies with highly separated sales and marketing departments, the sales process begins where the marketing process ends. While we encourage collaboration between sales and marketing (smarketing), it can be difficult to facilitate such collaboration quickly, especially for larger brands. In fact, even in more collaborative situations, it’s important to understand the breakdown of the sales-only portion of the funnel that comes into play after a qualified lead has been generated. Once a lead enters the bottom of the inbound funnel, they enter into the top of this sales-specific funnel. Another thing to consider is your industry. Sales funnels for many B2B industries can last several months, while a B2C ecommerce sales funnel may only last a few minutes. Your B2C sales funnel may begin with a website visitor entering the top of your funnel upon arrival. They may make it to the middle of your funnel when they add items to their cart or by simply viewing specific product pages and showing interest in a particular inventory category. The bottom of your funnel may be filled with people who initiated checkout but didn’t complete their purchase. This entire process could take minutes but still provide you with leads that need following up. The B2B sales funnel lives at the other end of the spectrum, especially in the case of those dealing with enterprise buyers. Website visitors may enter into the top of the funnel, but not make it to the middle until they fill out a form in exchange for a downloadable offer. These leads may need to be nurtured via email workflow for several months before converting on a bottom-of-the-funnel offer, qualifying them as being ready for sales team contact. This funnel is much more like those outlined in this article, but both funnels should be treated as highly valuable conversion engines. The B2C business may see a far higher volume of traffic to their website, generate far more leads, and require a sophisticated contact system to make the most of those leads that had displayed interest in their products. This highly sophisticated inbound sales tactic can also be incredibly beneficial to your outbound sales efforts. They can include your content in their outreach and showcase your expertise in helping other businesses just like theirs. They can use it to settle a wide variety of pushbacks or objections from their prospects. If questions arise during a call, they can use an expertly crafted article to answer it rather than trying to explain the intricacies of the topic over the phone. Interested prospects who are not yet ready to convert will likely continue to read your blog content, may convert on an offer, and eventually convert at a later date. Sales are essentially adding prospects to the top of the funnel by reaching out. Fundamentally, outbound sales can increase the number of people who search for your brand online. This can be seen through “branded” search traffic—people who type your company name in Google. Outbound sales teams who reach out to prospects with content can also create MQLs and early-stage leads from those who aren’t ready to take action today. If everything we’ve talked about in this article feels like a lot of work or even a bit overwhelming, we’ll be the first to admit that it can be. We’ve spent years developing systems to create effective inbound sales funnels for our clients and ourselves. It’s not an easy process, but the results from a full inbound funnel are absolutely worth the investment. For that reason, don’t hesitate to chat with our marketing experts to discuss how we can help you to create a consistent, predictable lead-generation engine for your business that optimizes the efforts of both your sales and marketing teams. We only work with companies that are a good fit and where we’re at least 95% confident we can have a substantial impact. If we can’t help you, we’ll be the first ones to tell you so. We take the time to discuss your needs, diagnose your challenges, and make recommendations on how you can optimize your website and customer acquisition system. Schedule a free strategy session with us today and we’ll see about putting your company on the fast track to optimized lead delivery and rapid growth. This is nice one but very long article to go through. I would suggest here a much smarter way to get this all done. Hire someone to get it done. People who start their business all alone get distracted at a later stage by all the kind of marketing efforts which includes making a conversion funnel. No doubt this is a very important aspect to have a successful business. But then the amount of time, effort and attention it demands, it then effects your content quality.